The air fractures into filigree with the movement of wings. 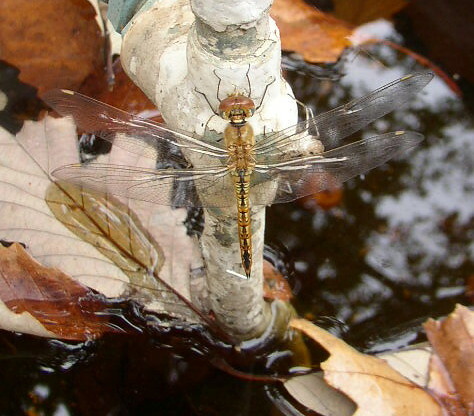 Dragonflies, dozens, hundreds, emerge every March on one collective birthday, or so it seems. They are one of Spring’s heralds for my part of the world. I know this because I’ve kept a sporadic journal for several years. I record my bird and insect sightings—and there is undoubtedly a cycle. Cedar waxwings, rufous-sided towhees, giant swallowtails, and dragonflies followed by the rupture of leaf and blossom. Before Easter, no matter whether it’s early or late, there’s at least one more freeze. Sometimes, it catches the critters by surprise. One morning, Todd and I went outside to start our yard work. The window ledges that face north and east were lined with dragonflies. The sight was somewhat eerie, as if a plague had struck them on the spot. Why they chose those places instead of the protection of shrubs and trees, I don’t know. We lifted one dragonfly from its spot to see if it moved. It didn’t, until Todd held it in his palm. Then it began to stir. The human radiant heat was strong enough to bring it back to life. We laughed. They were all too cold to budge. As the sun and temperature rose, they flexed their wings and shuffled their feet. By late morning, they had all taken to the air. We were having a beverage on the patio when Todd noticed the nest. Two wasps busied themselves under a hanging plant basket. I’d seen their work through my office window days earlier. The little abode had a slightly stout, conical shape. No doubt there was a brood to come. “I need to get rid of that,” Todd said. He’d had encounters with their angered brethren. I watched the cells get sealed with white papery membranes. Within weeks, some of them were torn and ragged. On a sunny and chilly afternoon, I ventured outdoors and looked at the nest from a different angle. I put my face within inches of it. Was that…? Yes, I saw the pointed face of a wasp peeking from one cell and the antennae of a brood mate nearby. Oh, it must be too cold for them to emerge right now, I thought. Touched by what I saw, I went inside to get the camera. Took a photo. 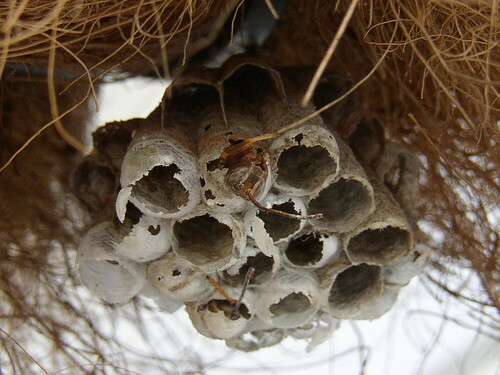 Days later, I remembered the nest and the young wasps. I peeked to see if they were gone. They hadn’t moved. They would never fly. They were stillborn. 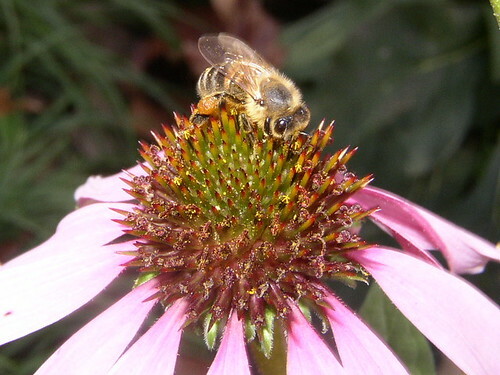 One November morning before I went to yoga class, I glanced at the patch of purple echinacea still blooming in the front yard. There was a tiny lump on spiky coned center. Frozen, figuratively, was a honeybee. Her wings were straight out at her sides, and her legs were curled inward, a slight cling to the top of the flower. I remembered our dragonflies’ suspended animation and considered, maybe, she was too cold to fly. Todd had the camera that day, and I was left with no way to capture the oddly beautiful sight. I thought about her last forage hours before. Had she been so occupied with her work—is that possible?—that she missed the sun’s fade to black? Had the temperature dropped more suddenly than expected, imperceptibly to a human being, and left her stranded with her evening’s bounty in her pouches and on her legs? She spent the night without her sisters. Without their warmth. In cold weather, bees congregate in their hives and trade places with each other to keep the group comfortable and alive, wings in motion. The ones on the fringe of the cluster’s center will eventually move inward. This constant activity provides enough body heat to get them all through the night. It seemed impossible that she could survive alone. When I returned an hour and a half later, she was still there. My hypothermic honeybee. Sunlight hadn’t reached the flower bed yet. I saw that she was leaning to her side. Oh, no, she’s dead. I cut the flower and attempted to bring her and it inside. She fell off. A brief search in the leaves yielded her gossamer little body. I scooped her on a dead leaf and brought it all into the house. My intent was to take a photo later, the fragility of the bee, the leaf, and the flower too wonderful to ignore. I placed them on the kitchen counter. Then I went about my morning’s business. Two hours later, I passed the spot and saw the bee had moved. I’d stirred the air walking by quickly, I thought. But I stopped and peered. She was crawling. Her legs scratched along the leaf. The heat in the kitchen must have revived her. She was still weak and couldn’t clutch the flower or a leaf, but she flapped her wings. She fell three times on her back—I felt terrible, was I hurting her?—but she kept trying to get up. Her underbody was gilded with thick gold pollen. Finally, I carried her safely on a dry oak leaf to the flower bed where I’d found her. I left her on a brick in the sun. An hour later, she was gone. I choose to believe she brought her evening’s treasure and a story of adventure back to the hive. And that she visits the flower bed now and then. Just so gentle and gorgeous. I’m not at all surprised you would take the time to care for a bee. With your lovely prose and your kind and compassionate heart you are like honey to me. Thank you, Zara. Your words worked some affirming magic today. Just like your words are to me – magic. I concur. This is almost like a prose poem. And the photos are beautiful also. Ella always notices little critters, caterpillars, flying things, and bugs. She makes tiny mumbly cooing sounds at them. I look forward to sitting in your big picture window as I watch her rummage around your yard with you and Todd. Wow, the dragonflies just sat there until they were warm enough to move? And I, too, must applaud the humanity it takes to take care of a chilly bee. That’s right–they didn’t budge until the temperature rose enough. I’m still surprised I’d never seen that before, considering my years on the planet. Nature rocks. I’m touched that you notice these little things and then relate them to the world so beautifully. Thanks for putting the bee on a brick in the sun. Amazing what one notices when life slows down a bit. Thanks, Emilie. Dragonflies are amazing. At our house, in the summer, they come in the afternoon en masse, and they suggest the helicopter fight scene from Apocalypse Now. We also have ladybugs in October — one minute they’re gone, the next they’re here, in numbers so vast Hitchcock could make a horror movie about them. I no longer like ladybugs. Or wasps. But dragonflies rule. By the way, I’d go nuts for the ladybugs. Ladybugs sounds so funny to my ears. We call them Ladybirds. I know! Isn’t it strange??! I started practicing yoga about eight years ago. That’s how I survived graduate school, restoring a house, and publishing a novel–with some overlap among them. I hope you continue to enjoy your practice. Thanks for reading, Alexis, and for the warm comment. Reading this transported me to a gentler/kinder/quieter place for a bit. Thanks, Ronlyn. You’re welcome. Thanks for visiting that space. Oh. I’m only just now reading this. So frozen and still and lovely. Thank you for the moment of peace before I fall asleep. Hope you had a restful slumber. There’s more like this to come, I think. Of all the lovely comments my work has received, yours is one of the absolute treasures. Thank you. Good. Thanks. Keep me as a subscriber. I would like to read your writing. I am retired high school history teacher. Friends retired English teachers. The stuff they call poetry these days like in New Yorker mag makes us gag. We see no literary art form in that or most contemp. poetry. Seems like authors hold these little conventions all over and give themselves little awards to perpetuate themselves and create a manufactured audience.And swoon over each other’s nonsense. One redeeming quality is sometimes refreshing enchanting metaphors surface in their writing. Maybe it’s just me because stuck in Milton, Donne, Bunyan, Chaucer, Emily, some Whitman, some Frost, Tennyson, Longfellow, some contemp Spanish and Dylan Thomas. ee cummings too. My blog mostly humor and cartoons and plan anti war posts like today’s for 2011. I rarely read poetry, vintage or contemporary. My pull has always been toward stories, and I think I’m just too lazy to find them in poetry. I’ll have to peek at your blog.